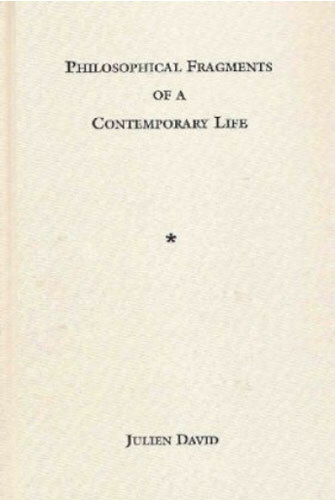 Brimming with insights and startling perspectives the most diverse aspects of contemporary life - from marriage and parenting to love, friendship, and the logic of the everyday - this exquisite collection of aphorisms and essays, is bound to make its readers stop and reevaluate many a truth and commonplace we live by. Philosopher, literary critic, and translator Julien David, whose real name is Michael Eskin, was educated at the University of Munich, the Institut Catholique de Paris, Concordia College, and Rutgers University. A former fellow of Sidney Sussex College, Cambridge, he has taught at the University of Cambridge and at Columbia University, and is the cofounder of Upper West Side Philosophers, Inc. He has published widely on literary and philosophical subjects, including Nabokovs Version von Puskins “Evgenij Onegin”: Zwischen Version und Fiktion – eine übersetzungs- und fiktionstheoretische Untersuchung (1994); Ethics and Dialogue in the Works of Levinas, Bakhtin, Mandel’shtam, and Celan (2000); On Literature and Ethics: A Special Edition of Poetics Today (2004); Poetic Affairs: Celan, Grünbein, Brodsky (2008); 17 Vorurteile, die wir Deutschen gegen Amerika und die Amerikaner haben und die so nicht ganz stimmen können (under the pseudonym ‘Misha Waiman’; 2008); Philosophical Fragments of a Contemporary Life (under the pseudonym ‘Julien David’; 2008); The DNA of Prejudice: On the One and the Many (2010); The Bars of Atlantis: Selected Essays by Durs Grünbein (2010; as editor). He has been a frequent guest on radio programs and lectures regularly on cultural, philosophical, and literary subjects across the US and Europe. 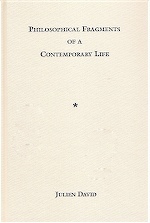 Philosophical Fragments of a Contemporary Life is Michael Eskin’s first publication under the pen name Julien David. He lives in New York City with his wife and three sons.